Free Happy Meals for NYPD Stop and Frisk Victims? 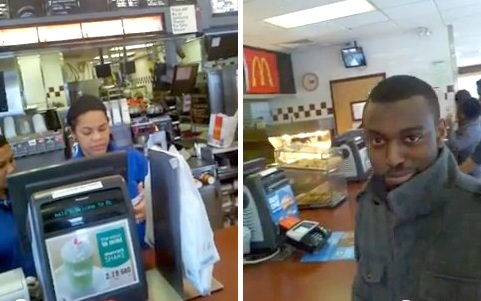 Prankster turns in his coupon for "Stop & Frisk" 3-timer free Happy Meal! See video, below. That was a popular reaction this morning to the news that McDonald’s had partnered with the New York Police Department to hand out free Happy Meals™ to those stopped and frisked three times without charge or summons. To many New Yorkers, it seemed an entirely plausible, if laughable, effort to address community concerns. After all, “Stop and Frisk” ensnared over 684,000 New Yorkers in 2011, 90% of them African American and Latino. The city’s police force seemed overdue for just such an image-burnishing makeover. So, was “Three Strikes You’re In!” an earnest effort to smooth things over with a disgruntled public? Not exactly. The website (since taken down at the behest of McDonald’s), Facebook page, and YouTube videos were all part of an elaborate hoax by People Enraged by Racist Policing (PERP), an activist group working with the Yes Lab at New York University. The group is seeking to highlight what they say are racist and discriminatory policies of the NYPD, while also calling attention to McDonald’s intense marketing of unhealthy food to residents of low-income urban areas. According to its own data, the New York Police Department made over 684,000 street stops in 2011, a 603% increase over 2002, when Mayor Bloomberg first took office, and a 14% increase over 2010. Nearly 90% of “Stop and Frisk” victims are African American and Latino, though they make up only 50% of the city’s population, according to the 2010 census. Fewer than 10% of the stops led to an arrest, and almost none of those to a conviction. In fact, many of those arrested found themselves handcuffed simply because they had questioned the right of the police to frisk them. Abusive policing also has less visible impacts on marginalized groups. Sexual assaults of women, profiling and illegal surveillance of Muslims, and inappropriate treatment of trans-gender, homeless, and immigrant New Yorkers are widespread, according to PERP. But why was McDonald’s part of the act? “Like the NYPD, McDonald’s specifically targets low-income communities of color, but in a different way: as markets from which to draw profits, at the expense of our health and well-being,” said Durant. McDonald’s 365Black.com website merges references to African culture with the company’s marketing goals. “Like the unique African Baobab tree, which nourishes its community with its leaves and fruit, McDonald’s has branched out to the African-American community nourishing it with valuable programs and opportunities,” says the website, which appears to be completely authentic. “Other than those who work for the McDonald’s marketing machine, does anyone ever use ‘nourish’ to describe anything about McDonald’s?” added Goralnick. The Yes Lab and PERP are not affiliated with any of these groups.